The (Central Water Commission) CWC has notified all by releasing the Official CWC Recruitment 2019. The declared recruitment is for the Management Trainee, Assistant Engineer, and various posts profiles. These are some tremendous opportunities for the candidates who are want to be part of the CWC department. All interested candidates can apply for the same. CWC Management Trainee, Assistant Engineer Recruitment 2019 applications will be starting from 15 February 2019 and it will be going till the 16 March 2019. The department has suggested all the candidates read the CWC Official Notification prior to applying for the CWC Management Trainee, Assistant Engineer Recruitment 2019. All candidates are requested to apply before the last date i.e. 16th March 2019. All information regarding the CWC Management Trainee, Assistant Engineer Recruitment 2019 is available on the official website. Also, they all can check the vital information from this article as well. All they have to do is read this whole article as we updated the essential links or information in this article as well. How to Apply for CWC Management Trainee, Assistant Engineer, and various posts? Management Trainee (General): Candidates having MBA Degree, Specialization in Personnel Management/Human Resource/ Industrial Relation/ Marketing Management/Supply Chain from any recognized university will be eligible for this recruitment. Accountant: Candidate should have a Bachelor Degree in Commerce/Charted Accountant/equivalent with 3 years experience in related field will be eligible for this post. Junior Superintendent: Candidate having Graduation in any discipline recognize institute will be eligible for this post. Click the Direct Link above to apply for CWC Recruitment 2018. Alternatively, you can visit the CWC Official Website. 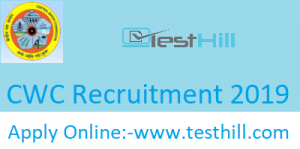 Note: To Know more Details About CWC Recruitment 2019 must Read Official Notification. The applications for the CWC Management Trainee, Assistant Engineer Recruitment 2019 will be started on 15 February 2019. Interested candidates can apply for the same before the last date i.e. 16th March 2019. The authority will not accept any application at any cost after the last date of submission. Candidates have to aware of their eligibility by checking the CWC Official Notification 2019. Aspirants have to pay attention while making the online application. Board will only accept the authentically filled applications. Authority has all rights to reject any application at any phase of the recruitment process. So, be aware while making the CWC Management Trainee, Assistant Engineer Recruitment 2019.